Large green olives are cured to perfection and then stuffed with whole, blanched California almonds to make a great snack. Serve with Brie cheese, French bread and a crisp white wine. Bought some of these yesterday, the are delicious. In addition to being awesome in martinis, these almond stuffed olives make a wonderful snack! I am addicted to the olives...I buy them by the CASE! I cannot imagine having a martini without these. They are the perfect combinations of slightly crunchy blanched almonds with salty, firm, and meaty olives. I cannot recommend them highly enough! Enjoy. Every time we travel North on the 5 we add your location as a must stop. 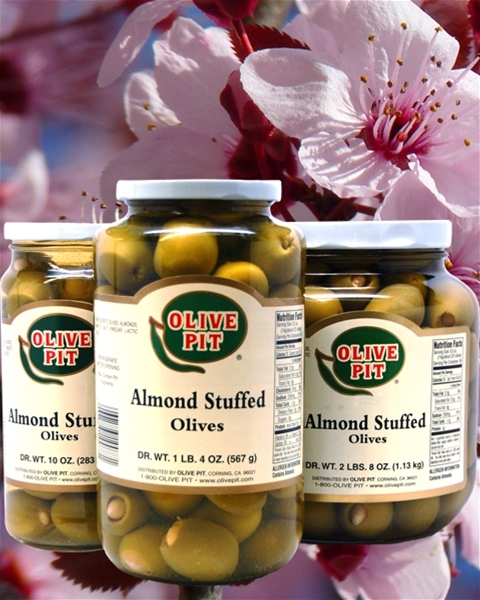 Love your olives, especially the Almond stuffed. So excited that I can order online now. Highly recommend a trip to the Olive Pit. Anytime we travel North on HWY 5, we always stop at the Olive Pit for a case of these excellent, large, juicy almond-stuffed olives. We love them in our martinis. We've tried several other styles but we always come back to this most perfect marriage of crunchy, blanched almonds and salty olives. BRAVO Olive Pit!